Join an alien on a journey through our Solar System. Visit NASA's kids' website for games, activities and the latest space news. See how space science helps everyday life on Earth then find lots of online fun, facts and activities at the European Space Agency site for kids. More space games, animations, projects and facts. Browse incredible pictures of planets, stars and galaxies taken by the Hubble space telescope. Find hundreds of facts about space. Meet some space scientists and find out why Pluto isn't a planet any more and why the Moon doesn't fall down. Take a guided tour of the ISS with an astronaut. Add a module to the ISS - and other fun activities! To try the module activity, click on "Mission Game 4". A flap book of astronomical proportions, packed with facts and information about the stars, planets and the universe. Fabulous double-page topics show our solar system, the Milky Way, how scientists think the universe was created and the latest space travel technology. Over 50 flaps reveal fascinating facts about the universe and there's a little book of star maps tucked in a pocket at the back of the book. Includes internet links to websites with the latest space information, games and photos. Helps young readers explore the furthest reaches of our universe, learning how it began and our place among the stars. Fun comic-style illustrations and flaps to lift and open make this internet-linked title interactive and informative. A colourful jaunt through the Universe, life, matter, elements and experimentation. The snippets of information on each flap encourage children to delve deeper. With over 50 embedded flaps to lift, this sturdy board book will provide many hours of happy and informative browsing. This book is a keeper and one that can be returned to time and time again. Every time we read it, I also learn something new! Another fantastic lift-the-flap book from Usborne. This book contains over 50 flaps for children to explore. The information is presented is both in depth and short making it engaging but not daunting. Each set of double pages contains one topic, making it a great book to dip in and out of. 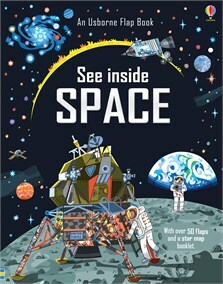 A really good book for children that are learning about space.